NASA/Advanced Concepts Lab, AMA, Inc. This artist’s concept of NASA’s X-57 Maxwell aircraft shows the plane’s specially designed wing and 14 electric motors. 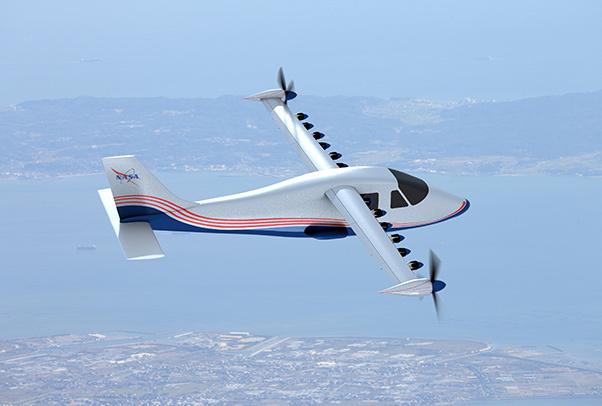 NASA Aeronautics researchers will use the X-57 to demonstrate that electric propulsion can make planes quieter, more efficient and more environmentally friendly. Now in its 70th year of operation, NASA’s Armstrong Flight Research Center at Edwards Air Force Base, Calif., continues to advance the agency’s overall missions of aeronautics research, Earth and space science, and development of aerospace technology. In the first few decades after it was founded in September 1946, NASA’s lead center of excellence for atmospheric flight research initially focused on experimental aircraft called X-planes that pushed the boundaries of speed and altitude performance. Since then, the center’s mission has expanded to include vital roles in the human spaceflight program, aviation safety, airborne science and technology advancement. In keeping with its roots, Armstrong is now returning to a new era of X-planes with the introduction of NASA’s first all-electric-propulsion aircraft as well as plans for a supersonic X-plane that could substantially decrease the noise made when an aircraft exceeds the speed of sound. NASA will soon fly an experimental aircraft powered by electric motors integrated into a high-aspect-ratio wing. The Air Force issued the official designation X-57 and NASA researchers dubbed the new X-plane “Maxwell” to honor James Clerk Maxwell, the 19th century Scottish physicist best known for his groundbreaking work in electromagnetism. The X-57 is the latest part of a four-year NASA flight-demonstration project called Scalable Convergent Electric Propulsion Operations Research, or SCEPTOR. The testbed is a highly modified Italian-designed Tecnam P2006T twin-engine light aircraft, in which the original wing and two gas-fueled piston engines have been replaced with a long, slender airfoil containing 14 embedded electric motors and propellers – 12 on the leading edge for takeoff and landing, and one on each wingtip for use at cruising altitudes. 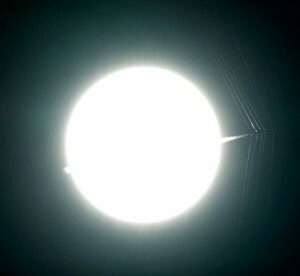 An Air Force Test Pilot School T-38C passes in front of the sun at supersonic speed, creating shockwaves that are captured using schlieren imaging techniques. The airframe for the X-57 was shipped from Naples, Italy, and arrived at Empirical Systems Aerospace’s (ESAero) facility at Oceano Airport, near Pismo Beach, Calif., on July 19. In September, technicians at Scaled Composites in Mojave, Calif., integrated Maxwell’s wing with its fuselage. NASA researchers hope to validate the idea that distributing electric power across a number of motors will result in a substantial reduction in the amount of energy required for a small general aviation plane to cruise at 175 mph. Flight-testing of the X-57 is expected to begin in 2017. This research continues NASA efforts to reduce aircraft noise, exhaust emissions, and fuel consumption. Electric motors are generally quieter than piston engines, and by using only battery power the X-57 will eliminate carbon emissions and demonstrate that aircraft need not rely on lead-based aviation fuel. These are all key elements in NASA’s New Aviation Horizons initiative, a 10-year plan for fielding a number of X-planes to demonstrate 21st century innovations for flight. NASA scientists are also exploring methods for controlling and lessening the effects of supersonic shock waves in the hope that federal regulators may one day allow commercial and civil supersonic flight over land in the United States. Such flying is currently restricted to military training operations within tightly controlled supersonic corridors in the National Airspace. Efforts at Armstrong in 2016 focused on better understanding the nature and structure of sonic booms. In March and April, researchers evaluated the performance of an air-data probe originally developed by Eagle Aeronautics of Hampton, Va., and subsequently redesigned by NASA. The Eagle Aero Probe was carried during seven flights on a specially instrumented flight-test fixture attached to Armstrong’s F-15B to measure the strength of the airplane’s supersonic shock wave. These tests continued work undertaken in 2011 and 2014. In future tests, the probe will be installed on either the nose of the F-15B, or on one of NASA’s F-15D aircraft based at Armstrong to study shock waves generated by another nearby supersonic aircraft. Expected to obtain more accurate data than traditional air-data sensors, the Eagle Aero Probe could help improve aircraft design tools for reducing the loudness of sonic booms from future aircraft. A new supersonic research air-data probe seen affixed to a flight-test fixture beneath NASA’s F-15B might one day measure the sonic booms created by a new generation of supersonic aircraft. Armstrong researchers are also refining techniques for capturing images of supersonic shock waves using schlieren photography. Flow visualization is one of the fundamental tools of aeronautics research, and schlieren methods incorporating a speckled background have been used for many years to visualize air density gradients caused by aerodynamic flow. A technology called Background Oriented Schlieren using Celestial Objects (BOSCO) effectively uses the sun as a background for capturing unique, measurable images of shockwaves. In March, a high-speed camera equipped with a hydrogen-alpha lens filter — commonly used when photographing the sun – was positioned strategically on the ground to capture a supersonic jet as it passed between the camera and the solar disk. The filter brings out the texture of the sun’s surface, and scientists then use that texture when processing raw photos into schlieren images of the supersonic airplane. Improved image-processing technology makes it possible to capture hundreds of observations of each shock wave and reveal details never seen before. These experiments, using a T-38 from the Air Force Test Pilot School at Edwards, built upon previous similar experiments undertaken at Armstrong in 2015. In February, NASA awarded a contract for the preliminary design of a “low boom” flight demonstration aircraft as part of the agency’s New Aviation Horizons initiative that was introduced in the Fiscal Year 2017 budget. 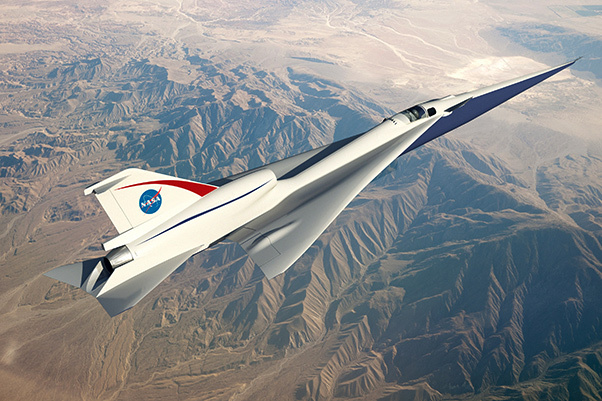 NASA selected a team led by Lockheed Martin Aeronautics Company of Palmdale, California, to complete a preliminary design for a Quiet Supersonic Technology (QueSST) demonstrator. 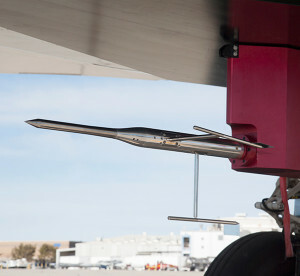 Researchers expect data from the BOSCO and Eagle Aero Probe experiments to benefit engineers in their efforts to design a supersonic aircraft that will produce only a soft “thump” in place of a disruptive sonic boom, thereby paving the way for practical supersonic flight over populated areas. Over the past several years, NASA has worked with the Federal Aviation Administration and industry partners to develop technologies that support safe integration of unmanned aircraft systems into the National Airspace System. Flight Test Series 4 of this effort, consisting of 19 flights spanning nine weeks, concluded on June 30. These tests successfully demonstrated two detect-and-avoid (DAA) algorithms developed by NASA, General Atomics Aeronautical Systems Inc., and Honeywell that generated precise alerts necessary for a pilot controlling a UAS from the ground to remain well clear of other aircraft. The Quiet Supersonic Technology, or QueSST, concept is in the preliminary design phase and well on its way to being one of NASA’s new X-planes. More than 260 scripted encounters were performed between Armstrong’s Ikhana UAS — a civilian model of the MQ-9 Reaper — and manned “intruder” aircraft including NASA’s B200 King Air, T-34C, G-III, and TG-14 aircraft, a Honeywell C-90 King Air, and a U.S. Air Force C-12 King Air. All aircraft involved in the tests flew predetermined flight paths that triggered the DAA alerting and maneuver guidance logic, allowing Ikhana’s ground-based pilot to avoid collisions. To make this scenario as realistic as possible, intruders were equipped with a variety of different surveillance systems that identified them as either cooperative (those capable of sharing their location electronically) or non-cooperative aircraft. This past summer, researchers at Armstrong continued working on an increasingly complex remotely piloted aircraft concept called the Preliminary Research Aerodynamic Design to Lower Drag, or Prandtl-D. This design features an innovative method for determining the shape of the wing with a twist that could lead to an 11-percent reduction in fuel consumption. The concept may also lead to significantly enhanced controllability that could eliminate the need for a vertical tail and potentially to new aircraft designs. Several radio-controlled models of increasing size, spanning up to 25 feet, have been tested over the past few years. Work on the Prandtl-D also led to a concept for a future Mars airplane. If the Preliminary Research Aerodynamic Design to Land on Mars, or Prandtl-M aircraft, is successful, it could be deployed from a satellite into the Martian atmosphere to collect and transmit valuable information back to Earth. Albion Bowers, NASA Armstrong chief scientist and Prandtl project manager has led the NASA effort with help from student interns. Dropped from a radio-controlled mother plane, a remotely piloted Prandtl-M glider first flew in August. The project is part of the NASA Flight Scholars activity, which focuses on giving community college students an early opportunity to perform research, and the Education Unmanned Aerial Systems activity, which provides college students an opportunity to work on NASA UAS projects. 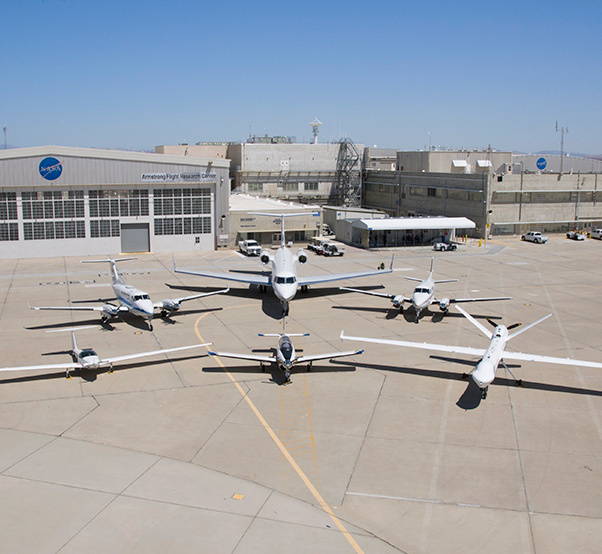 NASA’s Ikhana remotely piloted aircraft (front, right) along with five aircraft that served as airspace “intruders” during a series of tests to develop detect-and-avoid systems for integrating UAS into the National Air Space. In 2016, Armstrong’s airborne science fleet spanned the globe looking for answers to important questions about Earth’s climate. The center’s DC-8 flying laboratory deployed to New Zealand at the end of July as part of the Atmospheric Tomography (ATom) airborne science campaign to collect data on pollution in the lower atmosphere and its effects on the creation of greenhouse gases. 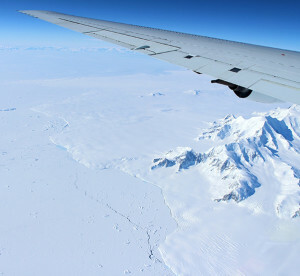 The aircraft, a modified airliner equipped with scientific instruments, landed in Christchurch at the beginning of a 26-day mission that included visits to the tropics, North Pole, Antarctica, South America, and Greenland.IOn October and November, a team of scientists aboard the DC-8 undertook the 2016 Antarctic Campaign of the ongoing Operation IceBridge. Data from these missions is used to document changes in polar land and sea ice, and to evaluate climate models. A laser altimeter records minute changes in the height of the ice surface from year to year so that scientists can compare the data and better understand the changing environmental conditions in Antarctica. Three additional radars are used to analyze elevation changes and the composition of snow and ice layers, as well as the shape of the land underneath. The DC-8 also carries a high-resolution camera system. Operation IceBridge is currently funded until 2019. During February, the Spectral Polarimeter for Planetary Explorations (SPEX) instrument made its first flight aboard NASA’s ER-2 high-altitude research aircraft. Developed by the Netherlands Institute for Space Research, the SPEX is designed to measure aerosols within the atmosphere and will later be developed into a spaceborne sensor. Acting as a surrogate for the future satellite platform, the high-flying aircraft completed a series of three flights to ensure that the instrument will function properly during flight and to prove its viability for future missions. In August and September, the ER-2 joined a NASA P-3B for a series of coordinated science flights in the ORACLES (observations of aerosols above clouds and their interactions) campaign off the west coast of Namibia. Southern Africa produces almost a third of the world’s vegetative burning, which sends smoke particles up into the atmosphere, where they eventually mix with stratocumulus clouds over the southeastern Atlantic Ocean. In order to help improve current climate models, scientists are using the ORACLES study to investigate how these particles and their interaction with the clouds impact both regional and global surface temperatures and precipitation. The P-3B served as a low-flying platform for in-situ and remote sensing measurements of aerosols and clouds while the ER-2 provided a high-altitude view of the same area of interest using a combination of polarimeter, radar, and lidar measurements. Expected to last several years, the ORACLES mission promises to provide scientific products with both short-term and long-term benefits for the people of southwestern Africa, as well as strengthening and focusing NASA’s existing connections to the regional earth science community. 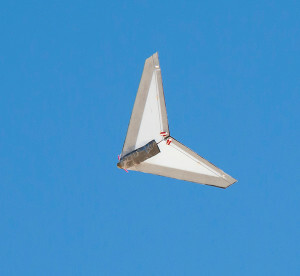 The Preliminary Research Aerodynamic Design to Land on Mars, or Prandtl-M, flies during a test flight. Students have conducted most of this research at Armstrong during the past two summers. As Hurricane Matthew bore down on Florida’s east coast in October, Armstrong’s remotely piloted Global Hawk research aircraft took part in the National Oceanic and Atmospheric Administration (NOAA) Sensing Hazards with Operational Unmanned Technology (SHOUT) field campaign. The civilian model of the Air Force’s RQ-4 Global Hawk reconnaissance platform was carrying an instrument called the High-Altitude Monolithic Microwave Integrated Circuit Sounding Radiometer (HAMSR), developed by NASA’s Jet Propulsion Laboratory in Pasadena, Calif. 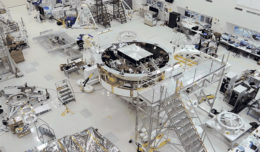 The aircraft also carried a dropsonde system developed by the National Center for Atmospheric Research, and the High Altitude Imaging, Wind and Rain Profile instrument managed by NASA Goddard Space Flight Center in Greenbelt, Maryland. As the Global Hawk made multiple passes over the hurricane at an altitude of around 55,000 feet, data were transmitted in real time via a communications satellite to the ground, where they were immediately processed and shared with the SHOUT scientists. Images and data were also shared with weather forecasters at the NOAA/National Weather Service’s National Hurricane Center. NASA’s Stratospheric Observatory for Infrared Astronomy (SOFIA) program had a very successful year with the completion of its fourth season of science flights. Cycle 4 missions began in February with plans calling for accomplishing as many as 106 flights and more than 550 hours of science observations by the end of January 2017. The SOFIA is a heavily modified Boeing 747SP airliner that carries a 100-inch (2.5-meter) telescope to altitudes between 39,000 to 45,000 feet (12 to 14 km), above more than 99 percent of Earth’s atmospheric water vapor, giving astronomers the ability to study celestial objects at infrared wavelengths that cannot be seen from ground-based observatories. During a flight in February, astronomers observed a planetary system around the star Vega (only 25 light years from Earth), a very young star some 1,500 light years away in the Orion star forming region, and a supermassive black hole hidden behind dense dust clouds in the center of a galaxy at a distance of 170 million light years. Scientists from the University of Georgia, University of Arizona, University of Texas at San Antonio, and the Space Telescope Science Institute in Baltimore, plus their collaborators from institutions in the U.S. and Europe, obtained data using the Faint Object infraRed Camera for the SOFIA Telescope, or FORCAST, a combined mid-infrared camera and spectrometer. SOFIA research efforts involve the study of planets, moons, asteroids and comets in our solar system; star and planet formation; extrasolar planets and the evolution of planetary systems; the interstellar medium and interstellar chemistry; the nucleus of the Milky Way galaxy, and nearby normal and active galaxies. The mountains of northern Alexander Island in the Antarctic Peninsula, passing under the left wing of the DC-8 aircraft carrying Operation IceBridge scientists and instruments on Oct. 14, 2016. In May, SOFIA’s suite of seven cameras, spectrometers, and high-speed photometers was joined by the High-resolution Airborne Wideband Camera-Plus (HAWC+) far-infrared camera and polarimeter. This is currently the only available astronomical camera for making images using far-infrared light, allowing studies of low-temperature early stages of star and planet formation. The SOFIA deployed to Christchurch, New Zealand, for seven weeks in June and July to conduct 24 science flights in the Southern Hemisphere. There, scientists had the opportunity to observe areas of interest such as the Galactic Center and other parts of the Milky Way that are not visible or difficult to observe from the Northern Hemisphere. The SOFIA project is an 80/20 partnership between NASA and the German Aerospace Center (DLR). Elements of the SOFIA program are located at NASA centers throughout California; the aircraft is based at NASA Armstrong’s airborne science hangar in Palmdale while the SOFIA Program Office is located at NASA Ames Research Center in Mountain View, which manages SOFIA’s science and mission operations in cooperation with the Universities Space Research Association (USRA; Columbia, Md.) and the German SOFIA Institute (DSI; University of Stuttgart). In July, NASA’s Flight Opportunities Program, which is part of the agency’s Space Technology Mission Directorate and managed at Armstrong, selected more than a dozen payloads for the purpose of exploring new space technologies. The program provides opportunities for large and small businesses and universities to demonstrate technologies of interest to NASA in a space-like environment by testing them on board commercial suborbital launch vehicles, reduced-gravity parabolic aircraft flights, and high-altitude balloons. Building a flight heritage enables these technologies to be more readily included in future NASA projects and to stimulate the growth of the U.S. commercial spaceflight industry. The selectees’ experiments included fluids and heat transfer testing, sample retrieval technology, robotics, oxygen generation technology, radiation measurements and testing of new facilities for experiments in the relevant environment provided by the flight vehicles.